Caution 415 volts symbol and text safety sign. Caution Switchgear symbol and text safety sign. Danger Live wires symbol and text safety sign. Danger Risk of electric shock text and symbol sign. Do not start this equipment when locked out sign. A-board, caution lockout procedure in operation. Lightweight, portable plastic board, double-sided, for temporary hazard situations. A-boards. 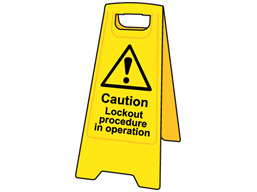 Caution lockout procedure in operation. Freestanding, lightweight, portable double-sided boards for identifying internal, temporary hazards. NSA18 Board size 480mm x 250mm, with print area 300mm x 200mm. Material corrugated plastic board.